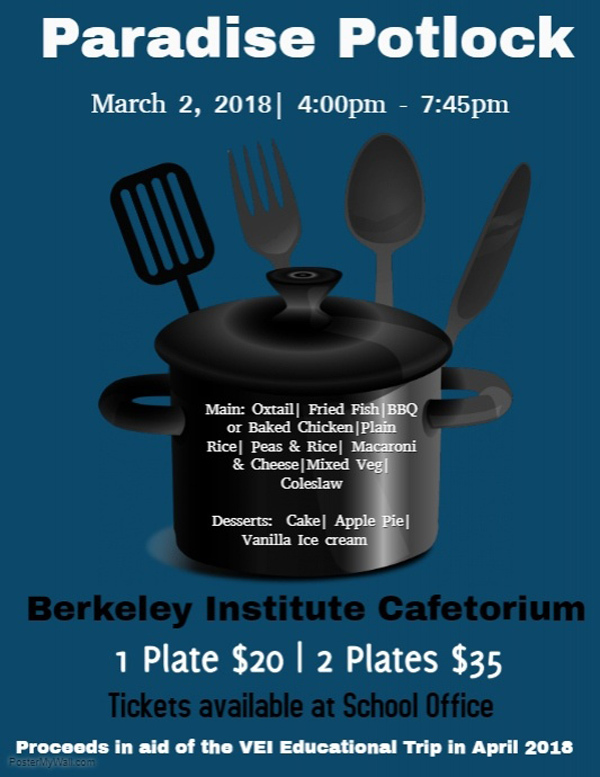 Students of the Berkeley Institute’s Virtual Enterprises International [VEI] class are planning a fundraising potluck dinner to be held on Friday [March 2] from 4.00pm to 7.45pm in order to help finance a trip to the 2018 Global Youth Summit Trade Show in New York. Kayla Simpson, Vice President of Fundraising, said, “Experience is the best way to learn, and the Berkeley Institute has implemented a class called Virtual Enterprises International [VEI]. This class is aimed at helping Berkeley students discover the value of working responsibly and allowing them to gain valued experience in real world business endeavors. “The VEI business class consists of 22 students/employees, and student have the opportunity to be a part of this once in a lifetime opportunity to collaborate in a virtual business environment with over 3,000 students/employees from around the world. A spokesperson said, “Please join us for great food sponsored by Jamaican Grill, Yardie Kitchen, Cake Shop, Gunners Cafe, Fish N’ Things, Casablanca, Quality Catering, Scoops, and Sweet Escapes. See the flyer for the menu choices. “Tickets can be purchased at the Berkeley Institute school office from 9.00am to 4.00pm or alternatively you can email kaylasimp790@gmail.com. For more information about VEI and the 2018 Global Youth Summit Trade Show, visit the website.